Welcome to Kingdom Hearts Truth or Dare! 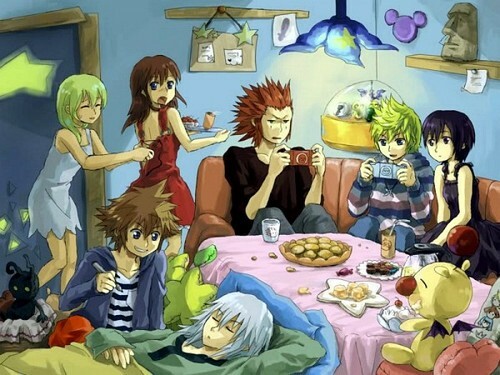 Where you, as a KH character, OC, or yourself can join and have fun! Before you start here's the rules you should know before you play! 5. Be nice, and be friendly! Respect and treat everyone how you want to be treated. And just have fun! Everyone is welcome. Here are the list of characters for the game. If there's a name next to that character that means it's for another member. You would have to choose another one. But remember: OCs are welcome! More will be added if you like! Enjoy! Well you can choose whether to be a character from kingdom hearts or not. If you have your own character or just want to be yourself you can do that too. The whole concept of the idea doesn't quite fit with the roleplaying section, and neither would it for fan-fiction. Therefore, I'd say it would be best placed in the Forum Games section. Given that it's in such a location, I wouldn't know how to reasonably enforce people sticking to a certain character (or something like that) but if the thread is simply liked well enough by some people, they will return to it and remain consistent within. I asked him before i made the thread because i also had a hard time deciding where this thread would go. Roleplaying, creative writing, or something else. Okay just making sure, just want to help your thread get the most "traffic"
This is a neat little idea, Miki! Thank you. ^^ Adding you to the list! Guess what? You're the first member! And every new member gets Papou fruit cookies and sea salt ice cream! Enjoy! Hmm... While we wait, where do you think this should take place at? The world that never was? Destiny island? Twilight town? Oh yeah! Almost forgot. FF characters are welcome too. I don't know all of them but i will add their name if someone asks to be one. I'll just play myself, if that's cool with you. You can just put me down as Lane, seeing as how that's my name. But Orion does make a good point. Get this going long enough though and you could have yourself a fan-fic. Just rework some things and add in a backstory to get everyone together. .... sorry, got a little excited there. Hehe, chicken. Okay, then, who's necklace is better, mine or Sora's? "FREEDOM!!! THAT DAMN CLOSET WAS GETTING SO OLD!" "Never its time for my dares to get coming and going!!! Lets do this.. before i kill someone.."
-he said green/red blood coming from his head..
Sora's, it's a pretty iconic crown. Nah, who'm I kidding, Dare baby dare! I really don't know what to ask him, is it like IRL or RP dare?